My daughter loves going to lessons and even loves to PRACTICE! -- Rhea S.
Instructor is very patient and kind. Relaxed and nurturing atmosphere. -- Joan G.
My son's love for and knowledge of music have blossomed. -- Michele M.
The lessons are both challenging and fun. My son really does love guitar! -- Joan C.
● Guitar is one of the easiest instruments for a child to learn. ==● Small guitars are affordable and a perfect “fit” for kids. ● Kids think guitar is cool! ​ ● We’ve developed a specialized curriculum that works for kids. ● We know how to make learning fun and easy. ● Over 90% of our students succeed long term! ● Childhood is the best time to begin learning an instrument. ● Learning guitar helps develop patience, self-esteem and discipline. ● Learning & playing guitar will provide life-long social benefits. ​ ● Ukulele is similar to guitar and another great option for children. Call to schedule a ​free trial lesson! The instructor is so patient, kind, and encouraging! My daughter loves going to lessons and even loves to PRACTICE! Excellent quality and affordable prices, can't be beat! 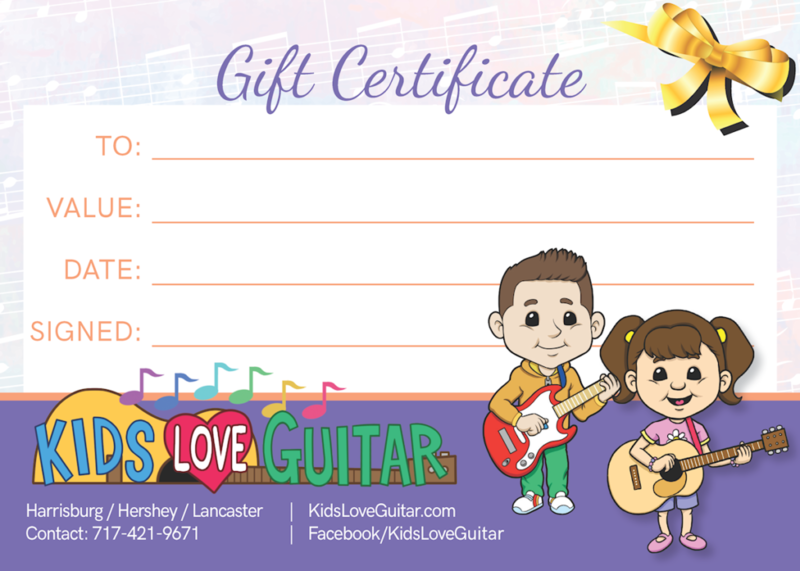 -- Rhea S.
Delaney has a awesome time at Kids Love Guitar! The instructors do a great job and she looks forward to her lessons. ​To see her playing music brings us great joy. ​She is so proud to share what she learns with us. Thank you Kids Love Guitar!​ -- Ralph M.
My daughter (7) has been taking lessons for a couple of months now and is playing and singing so nice! The instructor is great with her. She is patient and gets my daughter on track quickly. My daughter brings her music home so she can practice and I can help if needed. This is a fantastic place for lessons!! -- Dawn F.
Kids Love Guitar Facebook page.